You can use Mail, the Windows 8 Mail app, to access your Office 365 or Exchange-based email by using your email address and password. The Windows 8 Mail app is built in to Windows 8 and Windows RT. Note: If you have email through Office 365, see Use Office 365 on your Windows RT device for detailed information about how to use Office 365 on your phone or tablet. For information about Microsoft accounts, Windows 8 Mail in general, or how to connect to an email account that isn't Office 365 or Exchange-based, see What else do I need to know? Important: You need to have a Microsoft account to use the Windows 8 Mail app. Your Microsoft account is the combination of an email address and password that you use to sign into services like Messenger, OneDrive, Windows Phone, Xbox Live, or Outlook.com (formerly Hotmail.com). You can set up your Office 365 or Exchange-based email even if you're not signed in to Windows or Windows 8 Mail with a Microsoft account. If the Add your Microsoft account page opens, type the email address and password for your Microsoft account to sign in, and then choose Save. If the Add your Microsoft account page doesn't open, in the Add your email accounts, choose Outlook to set up our first account in Mail. If you're using a touch device, swipe in from the right edge of the screen, and choose Settings. If you're using a mouse, point to the lower-right corner of the screen, and choose Settings. In the Settings menu, choose Accounts > Add an account > Outlook. 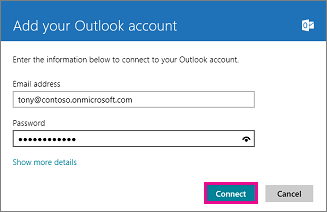 On the Add your Outlook account page, type the email address and password for the email account you want to add, and then choose Connect. Note: Mail will perform an online search to find your email server settings. If you see the “Your email account is successfully configured” message, choose Finish. If you see the Make my PC more secure message, read it, and then choose Enforce these policies. Important: If Mail can't set up your account, see What else do I need to know? If you're using a touch device, swipe in from the right edge of the screen to access your settings choose Settings > Accounts, and then select your account. If you're using a mouse, point to the lower-right corner of the screen, and choose Settings > Accounts, and then select your account. The following settings are available for most types of accounts. Set how often you want to download email from the server. Decide if you want Windows 8 Mail to automatically download images. If you choose Off, you can download external images in messages you receive on a per-message basis. Create an email signature that appears at the end of each message you send. The domain name for your account. This setting will be empty if you didn't enter a domain name when you set up your account. Whether the email service you're using requires a connection using SSL (Secure Sockets Layer). You need to sign in with a Microsoft account in order to use the Windows 8 Mail app. Learn more about Microsoft accounts and how to create a user account. For information about how you set up other accounts in Windows 8 Mail (for example, a Gmail or Yahoo! account, see Mail App for Windows: FAQs. For information about Windows 8 Mail features, see Mail App for Windows: FAQs. 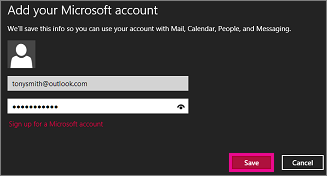 Outlook accounts in Windows 8 Mail use Exchange ActiveSync to connect to your email server. An Exchange ActiveSync connection supports the synchronization of email, contacts, calendar, and other information. All Windows Communications apps in Windows 8 (Mail, People, Calendar, and Messaging), can use the information that is synchronized when you set up an Exchange ActiveSync connection with your account. Adding an account in Mail will make your contacts and calendar data appear in the other Windows Communications apps. Learn how to sync Google services with Windows 8 or Windows RT, see How to sync Google services with Windows 8 or Windows RT. Learn how to manage your Windows 8 Mail App notifications, see How to manage notifications for Mail, Calendar, People, and Messaging. Windows 8 Mail currently supports connections to Office 365 and Exchange-based email programs using Exchange ActiveSync connectivity (in Windows 8 Mail, labeled the type Outlook account), and IMAP connectivity (labeled Other account). POP connections currently aren't supported. For more information, see Using email accounts over POP on Windows 8 and Windows RT. Windows 8 Mail does not support the S/MIME message format. If you're sent a message in the S/MIME format, Windows 8 Mail displays an email item with the following message body: “This encrypted message can’t be displayed.” To view email items in the S/MIME format, we recommend that you open the message using Outlook Web App, Outlook, or another email program that supports S/MIME messages. If your email account requires registration, you must register your account before you can set up your account in Windows 8 Mail. If you're an Office 365 user, you register your account the first time you sign in to Office 365. If you're not an Office 365 user, you register your account when you sign in to Outlook Web App or another Microsoft account. 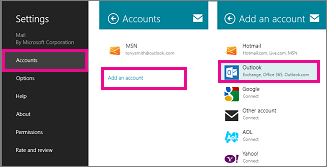 For information about how to sign in to your account or the Office 365 Portal, see Sign In to Outlook Web App. If you have trouble signing in, wait a few minutes and try again. If you still can’t sign in to Outlook Web App, contact the person who manages your email account. Verify that you're using the latest version of Windows 8 Mail. To check for updates to the Windows 8 Mail app, from Start, go to Store > Settings > App updates > Check for updates. Wait a few minutes and try to again. Review Microsoft troubleshooting articles. 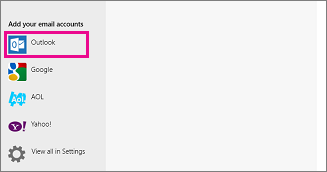 You can review Windows 8 support articles by category at the Windows Support website. Review a list of top solutions to Windows 8 email and collaboration apps on the Email and Communication page of the Windows website. View answers to Windows 8 email questions and post your own questions to the Windows 8 Email and Communications community. If you know the name of the person who manages your mailbox (sometimes called an email administrator), contact them and report the error you're getting when you try to connect with Windows 8 Mail. Try connecting to your account using Outlook Web App. For information about how to connect using a web browser, see Sign in to Outlook on the Web for business. Try connecting to your account using Outlook. If your device is running Windows RT 8.1 you can use Outlook 2013 RT, a version of Outlook 2013 optimized for touch, to connect to your account. For detailed steps, see Set up email in Outlook (for Windows). Try connecting to your account with Windows 8 by using IMAP4. To set up an IMAP connection, select the Other account option rather than the Outlook option during Windows 8 Mail account setup. When you set up an IMAP connection using Office 365 or other Exchange-based account, you need to manually enter your IMAP and SMTP server settings. If you’re connecting to your Office 365 email, the IMAP server name is outlook.office365.com and the SMTP server name is smtp.office365.com. If you’re not connecting to Office 365 email, see POP and IMAP email settings for Outlook. Try connecting to your account by using a different program that supports POP or IMAP. Note: Connecting to your account using IMAP lets you send and receive email for your account. IMAP and POP don’t let you synchronize your contacts and calendar information. For more information about POP or IMAP, see What are IMAP and POP? and POP and IMAP email settings for Outlook.